A MOUsigning took place between American International University-Bangladesh (AIUB) and Progressive Media Creations (PMC) supported by Bangladesh Investment Climate Fund (BICF) in arranging a 12 episodetelevision talk show named as “Orthonitir Chaka”. This program will be recorded and edited using the AIUB Media Studio. 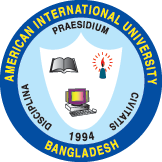 Dr. Carmen Z. Lamagna, Vice Chancellor, American International University-Bangladesh (AIUB) and Mr. Habibullah N. Karim, President, Progressive Media Creations (PMC) signed in behalf of their organization MOU. Mr. Shihab Ansari Azharof Bangladesh Investment Climate Fund (BICF). Dr. Anwar Hossain, Pro Vice Chancellor, American International University-Bangladesh, Ms. Dulce Z. Lamagna, Executive Secretary and Lecturer, Investment Climate Research Unit (ICRU) and Mr. S.M. Tanveer Ahmed, Assistant Secretary, Investment Climate Research Unit (ICRU) were present during the signing ceremony.